King Cobra eats girl alive. – my story. First of all let’s get something clear. I love sleep. All those people that say that sleeping is a waste of time and life is short… I’m here to tell you that I’m ok with it. I’m ok with a good sleep in or an afternoon 3hr nap. I know, I know… “they say” (and really, who’s “they”? Huffington Post?) that ‘a mid-afternoon nap of just 10minutes can help you stay alert for more than two hours when you are sleep deprived. But let’s face it people… if I’m getting into my cozy bed… I’m staying longer than 10minutes – I’m invested. I’m commited to you – I’m here to indulge in the afternoon ‘siesta’. Sleeping is a luxury – I know this better than ever now that I have two babies and I have to be honest.. we pratice sleeping in our household as much as we can. We encourage the ‘snuggle’ and I’m ok with that. I’ve always been a vivid dreamer. Sometimes I dream so vivid I can’t remember if it’s something I have actually experienced or if it’s just a dream. But… when you dream that you are being eaten alive by a King Cobra and you wake up out of your sleep gasping for air – that’s when you wish that you didn’t dream so vividly. Have you recently seen what a King Cobra looks like or how sharp his fangs are? I say “his” because I’m assuming that in this particular dream the snake was a male snake – not sure why, just a feeling I had. 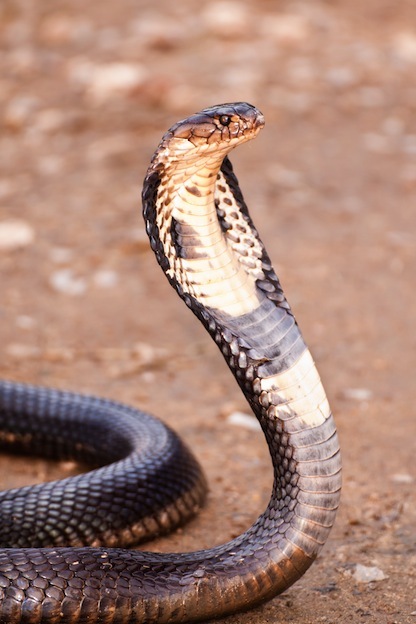 Let me remind you what a King Cobra looks like and some fun facts. a brownish cobra with an orange-cream throat patch, native to southern Asia. It is the largest of all venomous snakes. King cobras are located throughout southeast Asia. King cobras are the longest venomous snakes in the world. They average between 10 – 15 feet in length, and have the ability to lift one-third of their bodies straight into the air while the rest of their bodies remain on the ground. King cobras are smaller than some types of pythons and constrictors, but are very dangerous nonetheless. They are among the most venomous snakes in the world, and a bite from a king cobra can be deadly. My conclusion is: When someone tells you that you have a cancerous tumour spreading in your body… it kind of feels like a King Cobra is eating you alive.